We gathered for our Sept workshop at the ABK hall. Ten members attended. This was our second workshop on the monochromatic colour theme, with the experimentation with tints and hues. Demonstrating this time was sensei Janaki, who did a splendid job exploring pink and white in her two compositions. A beautiful composition exploring the various hues of pink, in a deep pink straw basket. 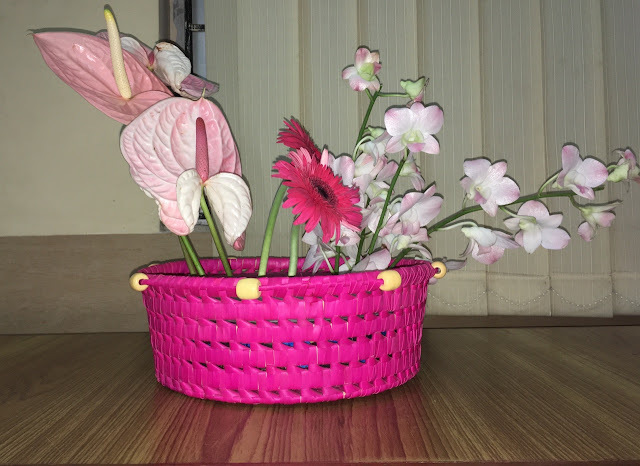 The anthuriums were placed providing depth, the jerberas reflected the colour of the basket and the orchids brought balance. 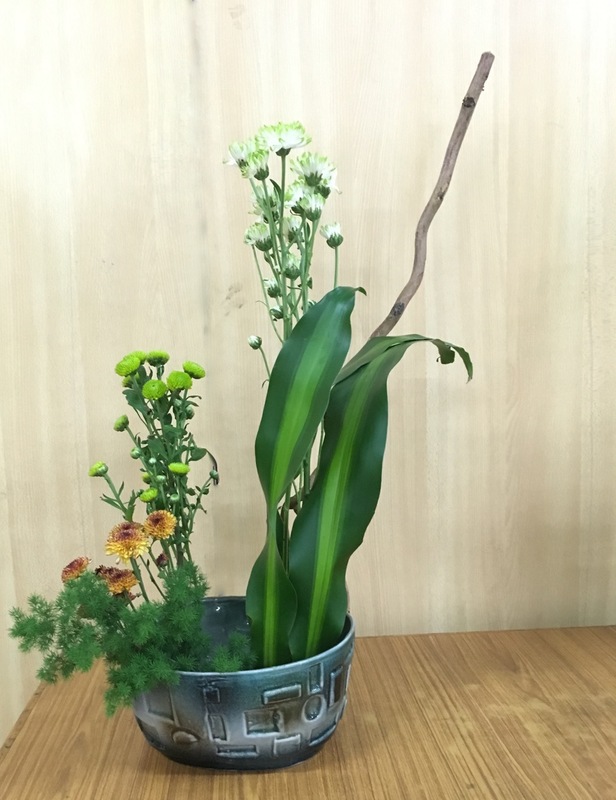 "Signs of Spring" was sensei Janaki's title for this composition in white, with chrysanthemums, anthuriums and baby's breath. 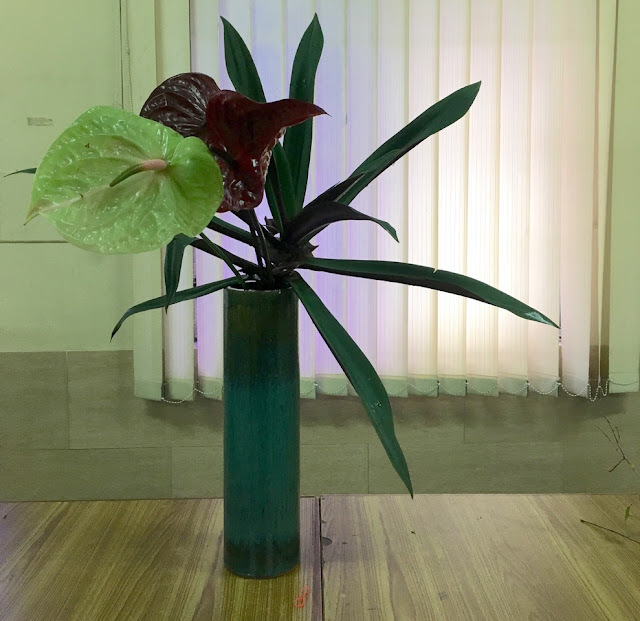 The tint of green in the anthurium stamen and stems of the flowers were the tint that was highlighted. Chitra Rajan worked with purple with lagerstroemia branches expanding the scale of the arrangement, exploring the darker tint with the croton leaves that she used lower down and complemented her vase. The orange circular vase used by Ambika led to her exploring orange and its tints. 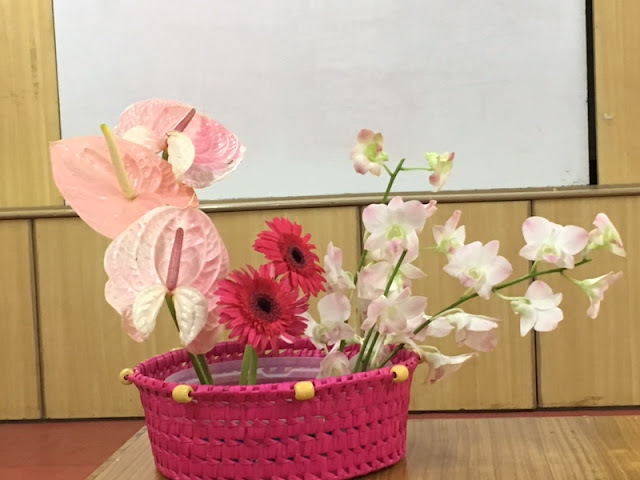 She tried to work with several materials and combined amaralys lilies, ixora flowers, carnations, Rangoon creeper and hypericum berries. A Pomogranate fruit reflects the colour and shape of the vase. 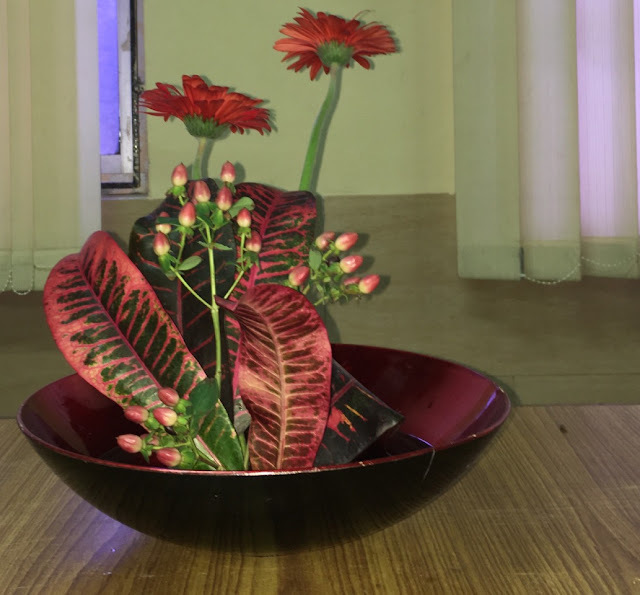 Bhuvana used her deep red/black bowl as the colour to explore, and her composition was a beautiful composition of red/black, with croton leaves, hypericum berries, and jerberas. The arrangement had depth and explored the surface/mass aspect of the leaves as well. 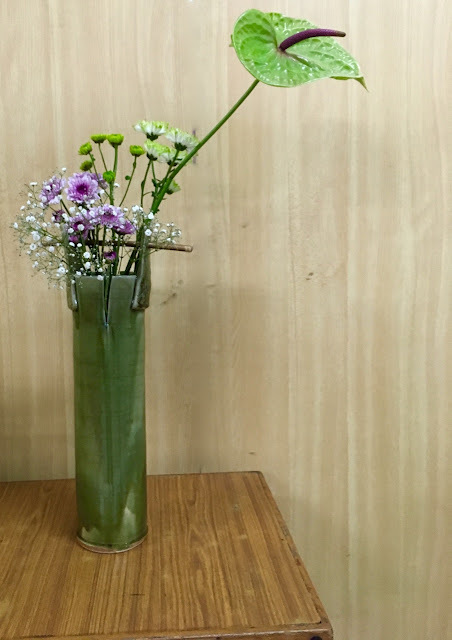 Sensei Malathi worked with a tall jade nagiere vase, exploring the entire range of hues from lighter green, through jade, to a tint of black-induced mauve. Sensei Prerana used a beautiful green ceramic nagiere vase and complimented it with the green anthurium and the pale green miniature chrysanthemums and button chrysanthemums.The mauve stamen is reflected in the mauve centres of the pink chrysanthemums which celebrates hue. The white tint is highlighted by baby's breath. Sensei Trishala also worked with green, and the brown/rust in her vase was reflected in the chrysanthemums. 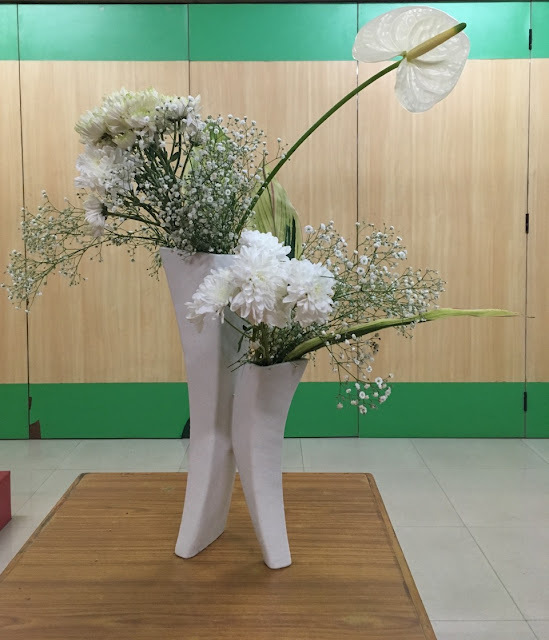 Chitra Thiagarajan used the white and brown of her vase (which is a bag!) as the base colour, to create this balanced and unique composition in white and brown. 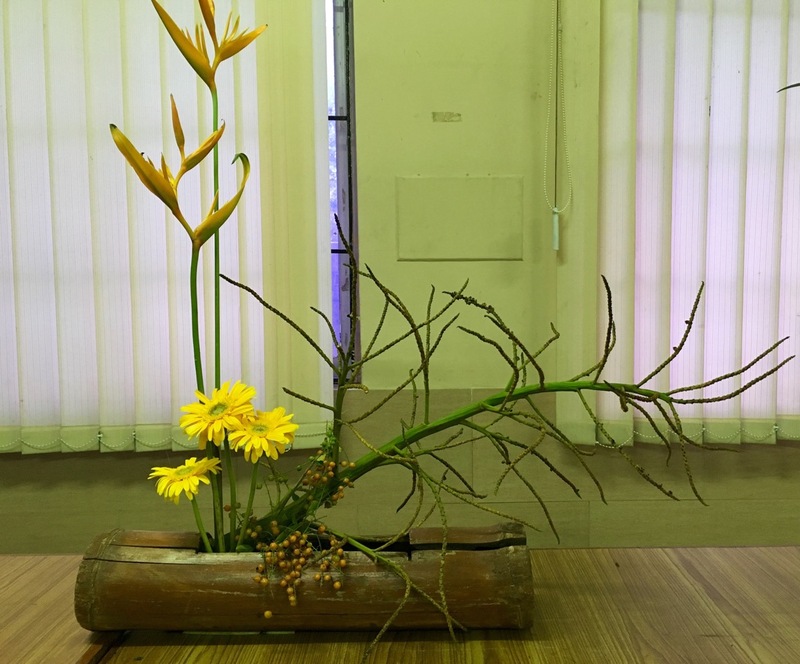 Sensei Molly explored yellow with her wooden moribana vase, with the sunny yellow jerberas and the slightly deeper heliconia, the yellow/brown berries and the brown frond of the palm. It was a challenging and interesting set of two workshops, working with single colours. Next month's workshop theme is all leaf. Thank you Ambika. 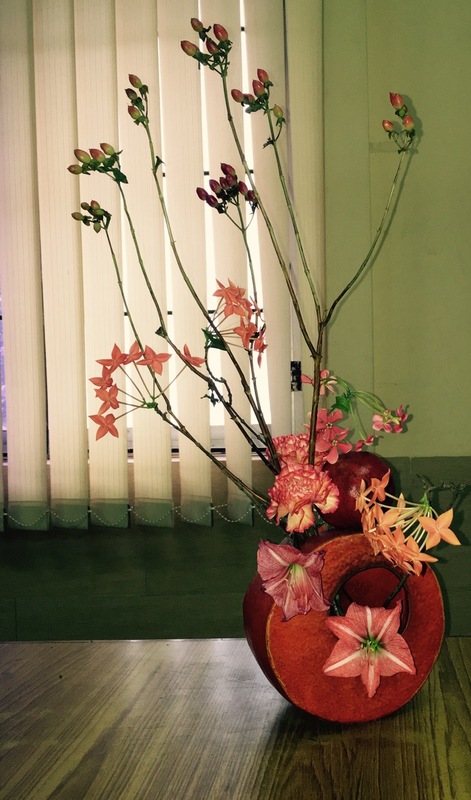 Malathi used jade leaves to compliment the jade vase. 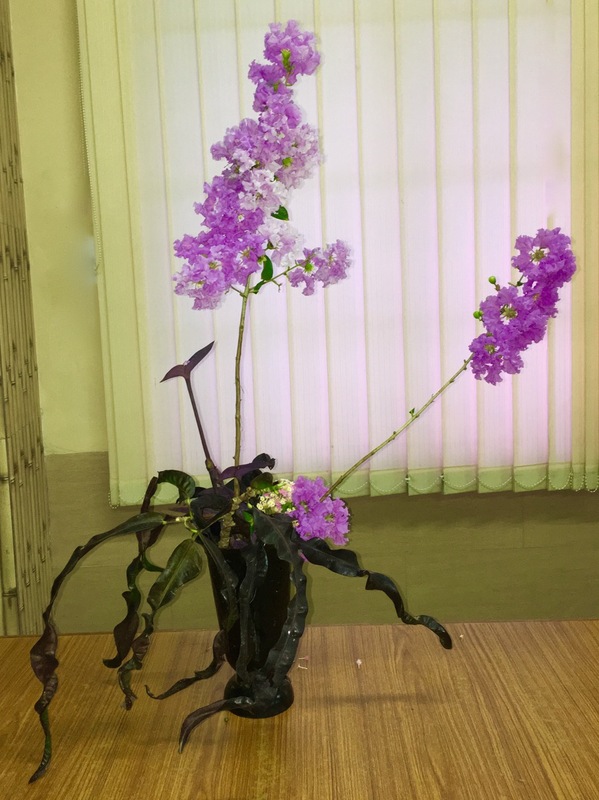 It is a two coloured leaf with purple on the other side, so that became a tint of the leaf and flowers followed colour and it's tint. 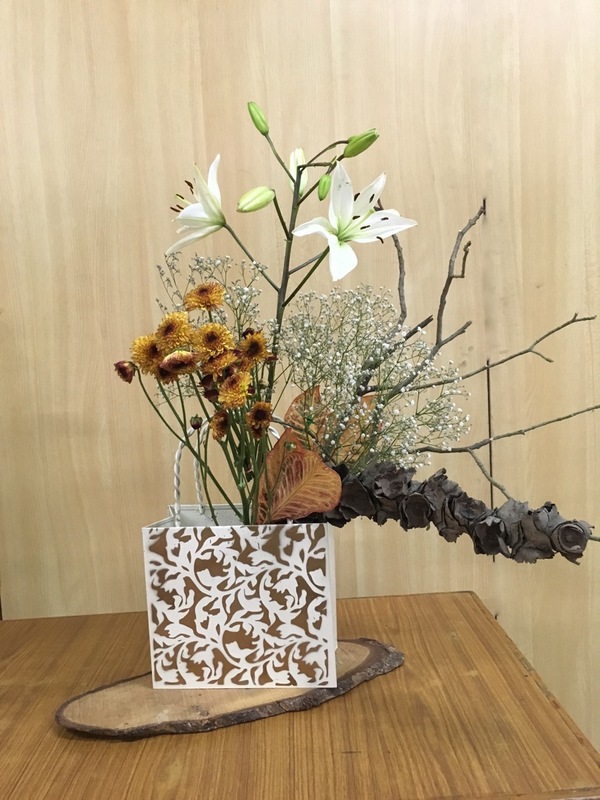 Chitra Thyagarajan's container is not a bag, but a ceramic container. 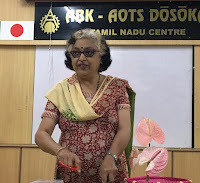 Malathi.